WHAT is “New Malaysia”, why has Pakatan Harapan not defined it through a comprehensive blueprint, and why are certain media accelerating adverse polemics on Tun Dr Mahathir Mohamad’s premiership? New Malaysia “emerged after the 14th General Election” last May, and is a “label now popularly used to describe the new PH government”. It is also “amorphous” and “has yet to be clearly defined, as it seems to mean different things to different people”. Dr Mahathir, however, mentioned at the recent United Nations General Assembly, that “Malaysians decided to change their government” because the “immediate past government indulged in the politics of hatred, of racial and religious bigotry, as well as widespread corruption”. This means PH victory in GE14 is the main determinant to the emergence of “New Malaysia”. But, since Dr Mahathir played a major role in securing this victory, it also means his leadership image and strategic culture are among the factors that enable PH’s rise to power. Based on the PH manifesto and Dr Mahathir’s speech at UNGA, the domestic goals of New Malaysia’s are conceptualised as — to uphold the principles of fairness, good governance, integrity and the rule of law; to build a nation that is inclusive and moderate; to eradicate politics of hatred, racial and religious bigotry, as well as corruption; to boost a fair and just economic growth; and, to conduct reform on political and administrative institutions. The goals of New Malaysia from the global perspective and in the context of Malaysia’s external relations and foreign policy, are conceptualised as — to maintain neutrality and non-alignment; to detest and abhor wars and violence; to promote cooperation based on mutual respect for mutual gain; to build a partnership based on the philosophy of prosper-thy-neighbour; and, to firmly espouse the principles promoted by the UN in Malaysia’s international engagements. As such, New Malaysia could be defined as follows — an era that denotes Malaysia under PH rule, and a concept that guides PH government in its state-making, nation-building, national development and external relations. Conceptually, New Malaysia needs an official definition and blueprint. Politically, it has no linkage to Malaysia’s social contract as the basis of the country’s national identity. Roger Tan, a member of the Malaysian Bar Council, had said last May that for Malaysia to progress, meritocracy should be practised “by not forgetting the poor and rural development”. Hence, PH has to officially conceptualise New Malaysia as comprehensively as possible, and produce its blueprint in the immediate future. This conceptualisation, however, has to take into consideration the spirit and principle of the social contract and the Federal Constitution. It also has to recognise Bersatu as a Bumiputera and Malay-based party and accept its latest proposal to incorporate a new agenda “which will truly help the Malays and Bumiputera economically”. This agenda has to be incorporated into PH policies, to enable it to “become the core policy” of the PH government. These pre-requisites will avoid the New Malaysia concept from being hijacked by cyber mercenaries who labelled Dr Mahathir as “racist” and “non-reformist”, and urged him to immediately relinquish his premiership. 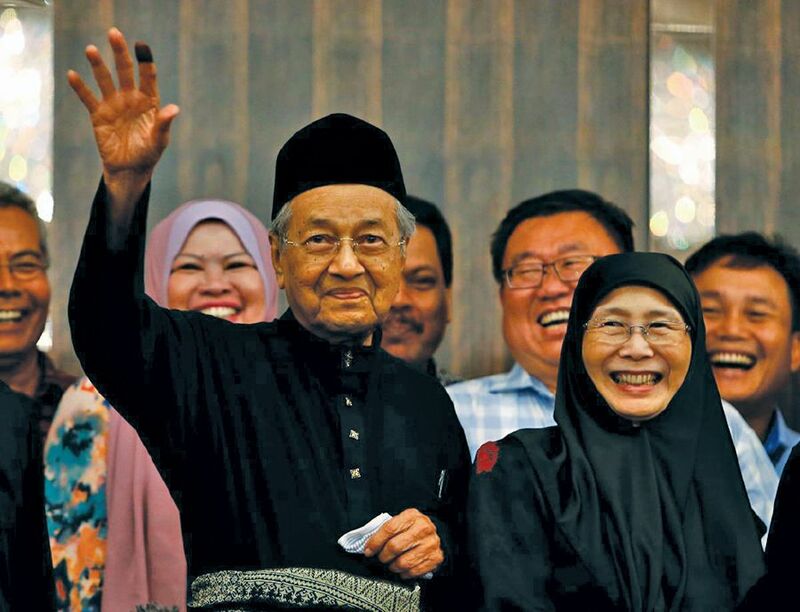 These polemics, after DAP threatened to leave PH “if the objective of New Malaysia is abandoned”, increased after an Invoke poll said Dr Mahathir’s rating dropped from 72 per cent to 53 per cent in Dec 2018. However, they continued even after the IIUM survey which said that Dr Mahathir still commands constant support of 62 per cent. But, why were these polemics specially targeted at Dr Mahathir? Was it because he intended to admit “good Umno leaders” into Bersatu? Could this move be considered as “racist”? Any analysis based on the narratives of our country’s diversity will definitely show that components of Malaysian ruling party had always insulated their race-based agendas into consociational democracy as the framework for national politics. This is because race-based policies in Malaysia could only be implemented after they are accepted on a consensus basis by all the components of its ruling party. Hence, the above polemics are detrimental to PH’s political stability, legitimacy, regime security and future survival, especially because Dr Mahathir is categorised in security studies, as a transcendental leader. “The transcendental leader has ambitions that extend beyond the state itself. He sees his state as an instrument that enables him to play a global role, and in doing this, his people are themselves ennobled” (Stephen Cohen  in Leadership perceptions and national security). In conclusion, the initial process in the making of “New Malaysia” is dependent on Dr Mahathir. Discrediting him, therefore, is politically incorrect, and misconstruing his action is ethically unwarranted.